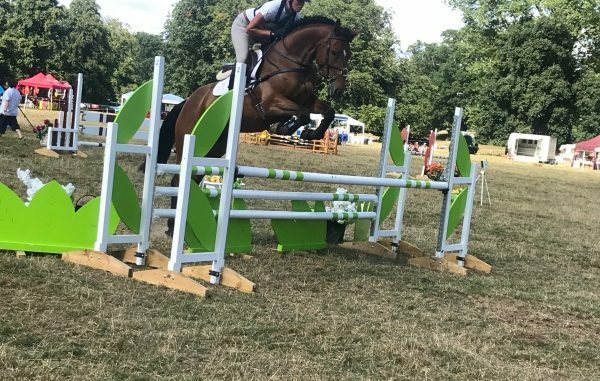 Munstead was the final event of the season for Ayesha Vardag’s lovely 5yo VIVENDI DE VARDAG. She has been a lovely horse to work with since she arrived at the end of May and we have spent a lot of time focussing on her dressage which was by far her weaker phase. She has improved out of site and has always been so rewarding to train, so I was over the moon to be rewarded with her best score yet of 28. She followed this up with a lovely double clear in side the time to pick up her best placing of 3rd in the BE100. It was a lovely way to end her season and she will now enjoy a well earned rest before getting cracking with her winter dressage and jumping. It was also a great event for Helena Vardag-Walters who I have been training this season. She performed a beautiful test on Noble Nutteller and then just rolled a pole SJ. Unfortunately Nutty picked up a cheeky run out XC in an otherwise foot perfect round. Star of the day was Helena on Vardags Bucephalus; she scored a 34 dressage and followed up with a beautiful double clear and pick up 8th place!